The major components of the costume were hand printed and hand sewn. The lycra hood for Cal-Pal was purchased and I ironed on the cotton transfer sheet. The yellow beanie, goggles and socks were purchased separately. For my Mike-ro-wave costume I hand sewed components of the Cape before ironing on the cotton transfer sheet to logo the back. The gloves were purchased separately and the mask I cut and painted by hand. In total it probably cost about $100 to $150 dollars. I spread the costume's creation out over the span of approximately 2 years so that I could afford all components. I wore it at home - unfortunately I left for college 1200 miles away this September and my horse won't be joining me until November. Despite not being able to spend my favorite holiday with her and show at the Halloween shows, I dressed her up for an early Halloween in August so that we may celebrate together. I plan on wearing the costume again next year as we spend our first Halloween in Wisconsin together! My family, friends and followers love it! Everyone is so happy with the final outcome. I even shared he photo on Twitter and the band member that I dressed my horse, Leena, up as, Calum Hood, favorited the picture! Leena, though unimpressed, was an absolute champ! I dressed her up in the dark one morning so that we may get our pictures as the sun rose and she was so patient! 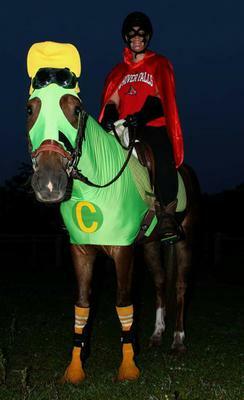 I also spent a lot of time desensitizing her to the Cape so that we may canter around as I wore it. I love my princess so much- I could not be more proud of her!! Great job Courtney. So proud of you! I like it and think it's the most creative and interesting thing I have seen. It is very beautiful and I love it. The love I see between these two is insane! The picture is gorgeous! If this isn't true love and Halloween spirit I don't know what is! Good luck Court! A truly original costume and Leena is a champ! I love your description - really great details.